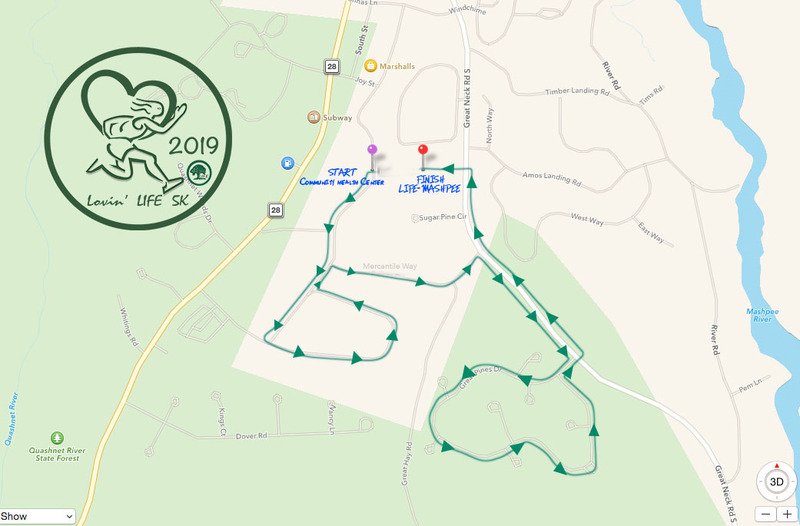 •	Parking: IMPORTANT that runners and walkers park in the lots where Marshall’s & Santander Bank are, around the corner from the starting line. •	Course: Flat except for slight hill right at start. Begins at Commercial Street, loop around Industrial Park, down Mercantile Road, right onto Great Neck Road South, right into and loop around Greenwood neighborhood, left back onto Great Neck Road South, left into LIFE Inc. Community for finish. •	Post Race: Block party with Food/Beverages/Music and lots of Family Fun! •	Benefits: LIFE, Inc. is a non-profit organization, serving adults with learning challenges. Proceeds will help fund our participation in Special Olympic sports year round. In consideration of your accepting this entry, I hereby for myself, my heirs, executors and administrators, waive and release any and all rights and claim damages I may have against LIFE, Inc., the Town of Mashpee, and any and all participating race sponsors and the directors, officers or employees and agents of such parties, their representatives, successors and/or assigns for any expenses in the event of an accident, illness, or other incapacity, regardless of whether I have authorized such expenses. I also give permission for the use of my name, voice, and/or my picture in any broadcast, telecast, advertising, promotion or other account of this event. I further attest that I am physically fit and have sufficiently trained for competition in this event. No dogs or rollerblades. I understand that the entry fees are not returnable even if the race is cancelled.